Listen, watch, more often, more closely. “Schön aber schwer” – beautiful but difficult – were the words I heard most frequently after the premiere of my opera Die Geisterinsel and from subsequent reviews afterwards. I often wondered how these terms together could be applied to a listener’s musical experience when they seemed so contradictory. What does it mean for a listening experience to be “difficult”? I have learned that this is entirely different than a musical experience that is alienating which often leaves one bored, passive and unable to enact. The poet J. H. Prynne describes difficulty in reading poetry as when “the language and structure of its presentation are unusually cross-linked or fragmented, or dense with ideas and response-patterns that challenge the reader’s powers of recognition.” I like to think that music too can be just as dense and able to challenge a listener’s power of recognition not through unusual sounds or sound textures but through a complication of music’s grammatical syntax by which energy can be released through the internal pressures of a compositional language. My music is experimental. Not in the sense of experimenting with sounds, technology or alternative modes of presentation that can often support an easy appreciation of the musical experience as much as a difficult one (although I explore these various areas in my works). I place experimentation in music with its “textual” qualities of phrasing and syntax, including its tonal patterns of cadence, tension and relaxation, consonance and dissonance, antecedent and consequent, rhythm and meter, and polyphonic textures. Although music is something other than language, its origins are with language’s expressive elements that bear innumerable motivated echoes to language’s syntax and structure. My musical language consists precisely of a de-hierarchization of musical syntactic structure so that “listening” becomes, under these transformed circumstances, a new experience. Virtuosity is also an aspect of my music, in the sense of striving for a mastery of compositional languages that range from the contrapuntal devices found in late Medieval and Renaissance canons and motets, or Baroque inventions and fugues, to Stockhausen’s serial constructions. I invent new contexts for a variety of these compositional languages to coexist and comingle. I utilize these compositional languages as expressive means in order to enter into a sonic world in which materials and figures from various modes of musical expression are blended together so that there is symbiosis between them. As Reeve and Kerridge suggest (albeit in another context), exchanges between different modes of expression can provide a challenge to the humanist paradigm by imposing shifts of scale that immediately disrupt any sense of personal, unmediated perception. It is in these “shifts of scale” where I place the issue of “difficulty” in the listening experience: my music strives for an active and alert listening that often challenges the listener’s powers of recognition without breaking completely from them. The “speculative turn” in music composition today is indeed not to excise music’s resemblance to language, and by extension music’s capacity for expression, but to decenter music’s humanized expression from its privileged position for the possibility of a music independent of language, thought and intentions. Of all the arts, I think that music composition behaves most closely to poetry. Indeed, music compositions’ origins stem from its relationship to spoken or sung text (as we see with early Greek or Chinese music, for example). But music compositions’ reach extends not to what some would call “sound” – a term I often find to be problematic and reductive in meaning – but to mathematics, as was recognized in the “musica speculativa” of the Middle Ages (i.e., the ability to sensorily intuit size, quantity, proportion and relation, for example). Mathematics, as a pre-linguistic activity (following L. E. J. Brouwer), can reveal in music a more fundamental ontology where expression has the capacity to achieve a lyricism beyond subjectivity (i.e., as the desiring “I”). Such a revelation can occur when music’s “textual” aspects are broken and damaged and there is leakage between the compositional work and the larger world order. Much of my compositional ideas and processes are influenced by my studies in poetry and film as well as mathematics. Music shares with poetry and film the essential parameters of rhythm, meter and tempo whereby internal pressures can be exerted upon material in order to disrupt a complaisant surface harmony and bring discrepant expressive materials together through the violence of montage and parataxis. Meter and rhythm are essential in breaking music’s “textual” aspects by becoming aggressively irregular in order to produce a tortured syntax and a compression of energy. By placing intense pressure on the sounds, music’s sensual qualities are experienced through its materiality. Such musical expression has a quality of contingency, or what composer John Cage would refer to as “anarchic harmony”, where sound is freed from human intentionality and reaches into the artlessness of nature. 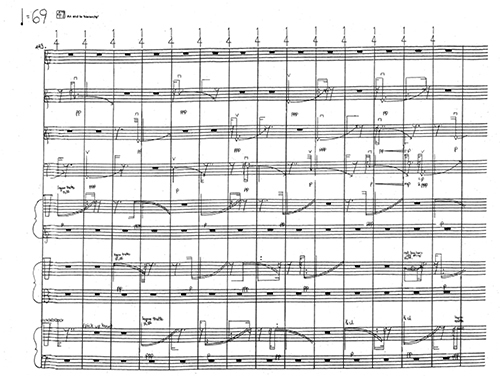 The effect of such contingency in the musical expression is a “noise-bearing” aesthetics where noise makes palpable the materiality of sound production and remains resistant to music’s expressive qualities. Questions of noise and interference bring to a listener’s attention the conditions under which a sound—or noise—is physically produced, what materials and energies are involved and what resistances are encountered. As the composer Helmut Lachenmann reminds us, the “beautiful” in music is only such when accompanied by a fair amount of initial resistance in the listener. Mine is a materialist music whose sound world lies outside of consciousness rather than a sound world fully endowed with consciousness, with the hopes of placing the listener in a space where one is required to rethink their personhood within a larger domain of life. Noise and the violence enacted upon my music through rhythm and meter produce a music whose very integrity is damaged and violated, signaling the opposition and resistance that certain lyrical procedures meet or defy. This opposition and resistance can open our listening to a different sense of musical expression, an expression that comprises sounds before they are fully recruited into the action of human agency.